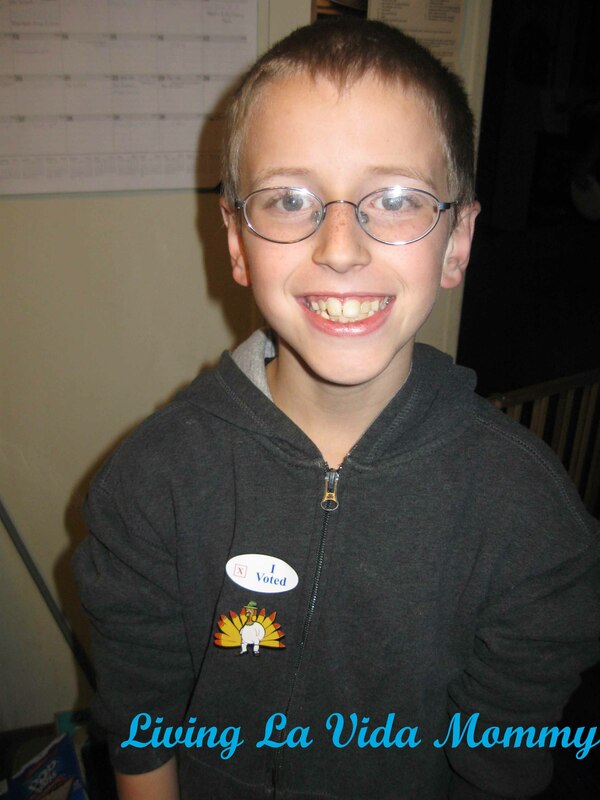 That, my friends, is the face of a very proud little boy who was taken to our local polling place to watch the right to vote exercised in person. The kids school did a mock election, which of course brought the children home with some very interesting views shared from their friends who were no doubt repeating things they heard their parents say. It’s a fine line, trying to explain to them what each candidate stands for without tainting them with our opinions. I think they deserve to make up their own minds, too many people automatically support who they think they should, as opposed to who they are more in line with. How awesome it is, to live in a country where our say matters. People give their lives defending our right to vote. Whatever your political beliefs are, whoever you supported, I just hope that you voted and that you realize that every single vote matters. 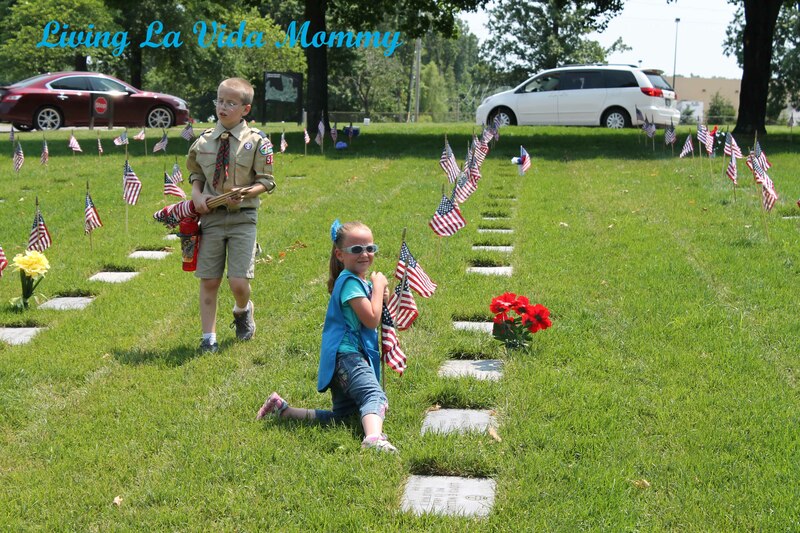 We are a part of history, and our children are watching us shape it. God bless America. And thank goodness the mud slinging election ads are over! Whew! I have never in my life been so happy to see a commercial for toilet paper as opposed to another ridiculous political ad! Okay, this is exciting! As I have mentioned before, my family is slowly working to make ourselves more “green”. Through a lot of research and plenty of trial and error, we are changing the way we do things in a way that works for us. Having four evil spawn, err…I mean lovely children!! Ahem, well, there a lot of lunches and snacks made in this house that need to be taken on the go, whether its for school or travel or just to keep the peace at on an extra long day of errands. I will admit it. We go through an obscene amount of plastic snack and sandwich bags. I had been wanting to phase out the plastic, but was unsure where to start. Ummm….Okay, when I saw the sugar skulls, I literally squealed with delight! I have witnesses, my husband ran in to see what was wrong. Love, love, love. Right away, Isabella wanted to claim it as her own. I see a large purchase order for snackTAXI’s in my near future! 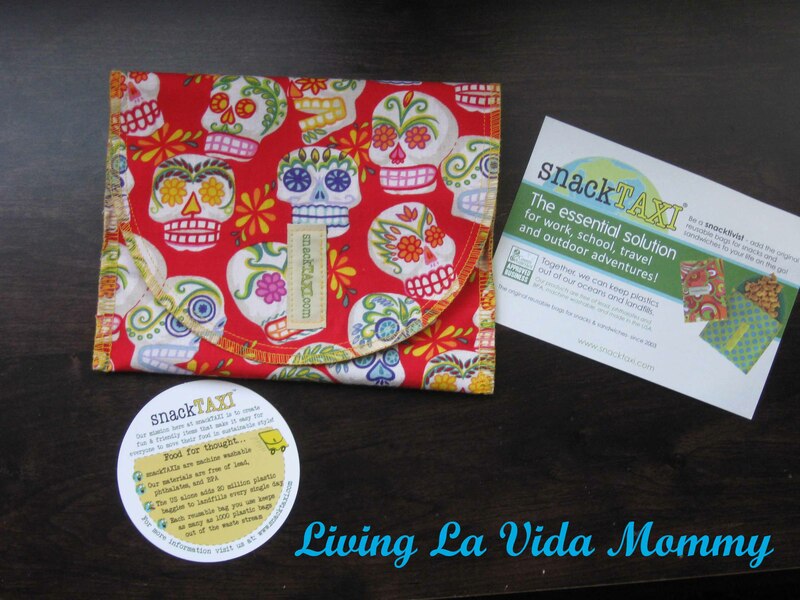 snackTAXI’s are reusable bags for sandwiches and snacks on the go. They are machine washable, free of lead,phthalates and BPA, and they are made in the USA. On their website, they mention that they are committed to keeping their business local and will never outsource their labor. Are you falling in love yet? In just the US alone, 20 million plastic baggies are added to landfills every single day. Yuck! And imagine all of the baggies that get thrown on the ground, or end up in oceans and rivers, causing hazards for wildlife, not to mention the hazards they pose to us! Every reusable bag that you use and add to your regular rotation can keep as many as 1000 plastic bags out of the waste stream. 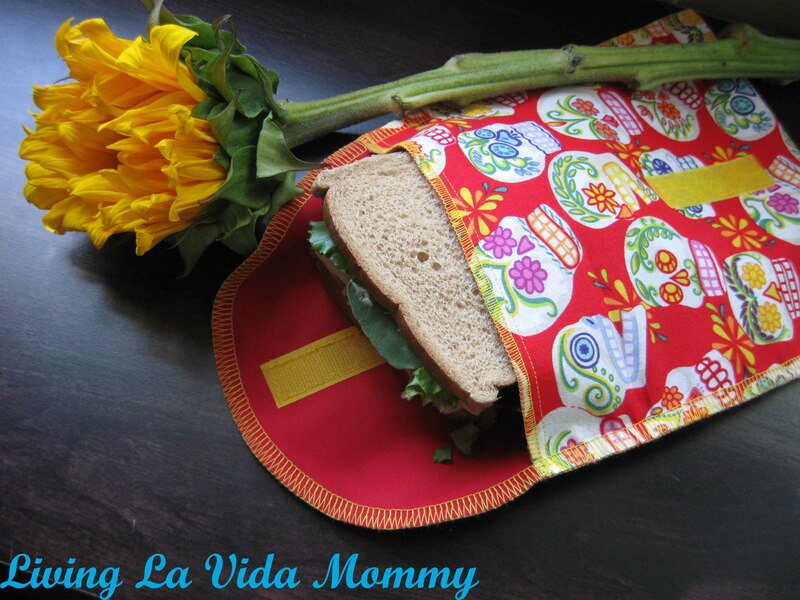 Imagine if every single household could add some reusable bags to their lunch assembly line. Think of the difference that could make, both in the landfills and in your wallet! I put my snackTAXI through some good testing here at the casa de locos. One thing I wanted to be sure and test was if it would effectively keep a sandwich fresh. I worried if the bread would get stale in the snackTAXI. Worry not! I made this delicious sandwich in the morning and did not meet up with it again for a good six hours. When I opened the snackTAXI, my sandwich was just as fresh as it was when I prepared it hours earlier! I also filled my snackTAXI with some crackers, cookies and fruit for the kiddos. They held up wonderfully, and the snackTAXI was no worse for wear being handled by the hungry little monsters. How could you not choose this beautiful bag over some piddly little plastic bag? And on their website, they have tons of choices for you to choose from! They also have other fun products to browse through while you’re there stocking up! I am absolutely going to be stocking up on these as we phase out the plastic. The hardest part will be choosing which designs to get! You can go to snackTAXI’s website by clicking HERE. And go “Like” them on Facebook by clicking HERE. The awesome people at snackTAXI very generously provided me with this product free of charge to review, but I did not receive any monetary compensation for sharing my love of their awesome product!